Steven Mueller Architects of Greenwich presented an architectural scholarship award to New Canaan High School senior Nicolo Scandiffio. 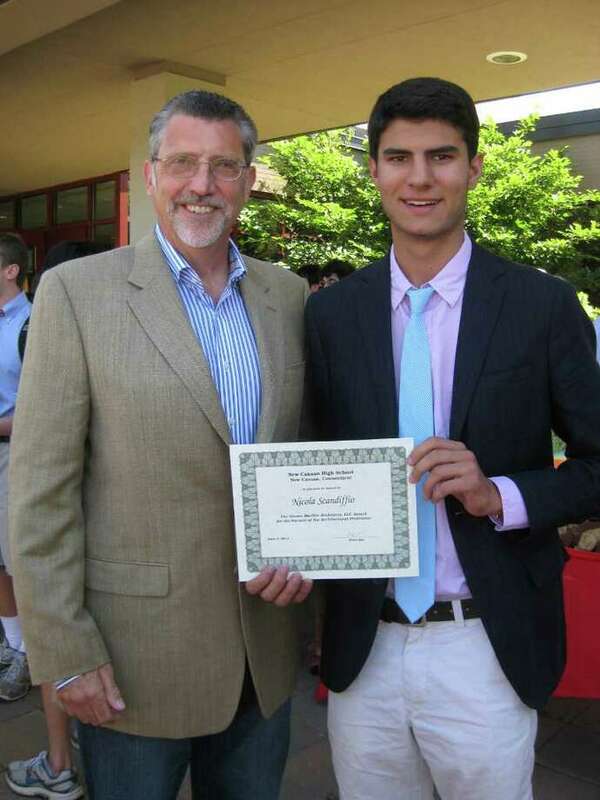 Steven Mueller Architects LLC of Greenwich sponsored an architectural scholarship award which was presented to New Canaan High School senior Nicolo Scandiffio. The "Steven Mueller Architects, LLC Award for the pursuit of the Architectural Profession" was presented by Steven Mueller, AIA at the annual New Canaan High School recognition assembly June 3. Mueller was inspired to create this scholarship award after speaking at the New Canaan High School career night March 22. "The crowd of enthusiastic seniors expressing passion and interest in architecture moved me to want to do something that would support and encourage a young man or woman to pursue a truly rewarding profession that requires both business and design skills" Mueller said. "I was both impressed and honored to receive Steven's phone call expressing his personal interest in our students as a direct result of participating in our annual career night," assistant principal Ari Rothman said. "His personal passion for architecture and his interest in making a contribution to a student in our community was most welcome. After a brief discussion we determined that a scholarship award to an aspiring young architect would be appropriate and impactful." Nicolo Scandiffio will be attending Pratt Institute in New Your City in the fall. SMA is a principal-based architectural firm in Greenwich. The firm is dedicated to design excellence specializing in both architecture, and interior design. SMA has received numerous awards for design innovation and excellence. For more information, contact Mueller at 203-869-3758 or visit www.stevenmuellerarchitects.com.